Jerry was born in Ceska Bela, in the former Czechoslovakia, in 1928. He led a long and interesting life. Jerry was predeceased by his father, mother and sister in Czechoslovakia. He is survived by his wife, Libby, his daughter Inka, and son John, both residing in Edmonton. He is also survived by his daughter Lilya Tomanova of Moscow, Russia. Jerry’s long life contained many unique chapters, which helped to make him into the unforgettable person that he was. His teenage years were spent under Nazi occupation, which resulted in time spent in a work camp, and later in Resistance groups. After the end of WW2 he completed high school and then attended Charles University in Prague. 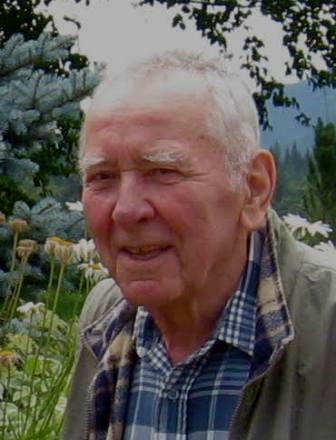 He graduated as a Forester in 1952. Jerry then served for two years in the Czech army as an officer in the Paratroopers. After several years working in reforestation in Czechoslovakia, Jerry pursued graduate studies in Leningrad. He spent some of the best years of his life travelling on horseback, doing research in the Caucasian Mountain region of the Soviet Union. He achieved a Ph. D in forestry as a result of this work. In 1969, Jerry immigrated to Canada, coming to Edmonton, Alberta. In 1974, he and wife Libby went to Iran, working in the Caspian Sea area. They returned to Canada, and Jerry was able to fulfill a lifelong dream of owning a cattle ranch after they purchased land in Little Fort BC. Jerry’s wanderlust was still in place however, and he spent periods of time doing consulting work in Turkey and then about five years in Guyana, South America. As Jerry entered his seventies he slowed down a bit but still learned to fly an airplane. He spent more time working on the ranch and enjoying his family. About this time, Jerry was diagnosed with Parkinson’s disease. Unfortunately, this led to him spending the last four years of his life in Forest View Place, in Clearwater BC. He received wonderful care there thanks to the remarkable and compassionate staff that made his last years as comfortable as possible. So very sorry to hear that Jerry has passed away. Please accept our sincere condolences. Although he hasn’t been well for some time, the finality of passing always leaves a void in your heart. Relish the memories you have of him and his interesting life and take solace in knowing he is now at peace. Libby, I am sorry to here about Jerry. I always thought of Jerry as a very interesting and friendly person. He will be missed. I hope you, Inka and John are able to adapt to your new reality. I only knew Jerry through Forest View. I made a point of saying hi as well as stopping to say a few words when I would come in. I saw the wonderful care you and the staff gave him he was treated so well.. I sure wish I could have heard his stories. Take care and please accept my condolences.